On Wednesday February, 25, the Swartdogs set out on an adventure after getting out of school early. The early dismissal was caused by a snowstorm, not the most optimal weather for driving to Duluth, MN. Even so, students were glad to set off early, ready for the upcoming Northern Lights Regional Robotics Competition. We arrived in Duluth around 6:30pm and drove to the arena where students unloaded the bus and took the robot and tools to our pit location at the Duluth Entertainment and Convention Center. Thursday morning, students got to sleep in a bit longer than normal compared to other regionals, since we were in a hotel that was close to the arena. After breakfast, we walked to the arena through the covered skywalk system. The day was spent getting the robot inspected and testing it in practice matches. This was also a time to see if other teams needed any assistance, in getting their robots running. While the students were busy with our robot and scouting, many of the team mentors were involved in volunteering to help make the regional run smoothly. Volunteer assignments included two inspectors, field setup and reset, referee, pit administrator and control system advisor. Qualifying matches began Friday morning and ran through the Friday afternoon and Saturday morning. During qualifying matches, teams are paired randomly with 2 other teams for each match. The scores of all your qualifying matches are averaged together and used to rank the teams. The top 8 ranked teams after qualifying rounds automatically advance to the playoffs and become alliance captains. These alliance captains then select two other teams to be their alliance partners during the playoffs. The qualifying matches on Friday and Saturday morning went very well for us. Our robot, “Schumacher”, excelled at stacking totes and at the end of the qualifying rounds, we were ranked 2nd. The top ranked team, Team 3130, selected us and Team 4215 as partners. Our alliance partners were fantastic to work with. 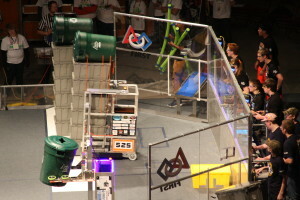 One of the favorite moments in play offs was the match where our alliance scored 163 points. In another memorable match, the buttons on the controls were not working, but drive team did some quick trouble shooting to solve the problem and still make two stacks of totes. 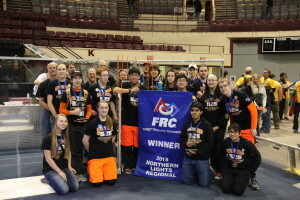 We were very fortunate to win the Northern Lights Regional and could not have done it without our alliance partners. In addition to winning the regional, we were delighted to receive the Imagery Award. This award celebrates attractiveness in engineering and exceptional visual aesthetic integration of machine and team appearance.